Marino Paul Pieretti was Born September 23, 1920 in Lucca, Italy. Lucca is an Ancient and medieval city located in Tuscany, famous for its intact Renaissance city walls. 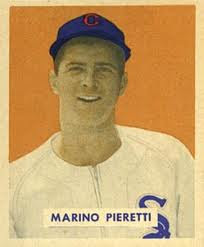 The Pieretti family emigrated to the United States when Marino was one year old, settling in San Francisco California. There he grew up and became a right handed pitcher, but at 5’ 7” got rejected by the PCL’s San Francisco Seals because he was considered too small. He eventually pitched for the Portland Beavers and after winning a league leading 26 games, in 1944 got signed by the Washington Senators. He came up to the big leagues the next season having his best season going 14-13 with a 3.32 ERA, pitching in 233 innings only striking out 60 batters. He pitched three shutouts as well as saving a pair of games in relief. 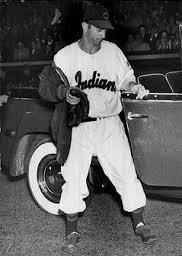 He was used mostly out of the bullpen the next two seasons going 4-8 into the middle of the 1948 season when he was traded to the Chicago White Sox. He was 8-10 the rest of the way. In 1949 he fell to 4-6 with an ERA of 5.51, and he was traded to the Cleveland Indians. After 29 games going 0-1, his MLB career was over by 1950 at age 30. That season he gave up Joe Dimaggio’s 2000 career base hit & personally went over to first base to hand the ball to his boy hood friend from San Francisco. In his short six year career Pieretti was 30-38 with eight saves posting a 4.53 ERA. In 194 games he made 68 starts, had 188 strike outs with 321 walks in 673 innings. He was a pretty good hitting pitcher batting .217 with 18 RBIs in his career. 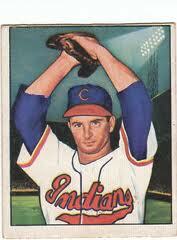 Marino pitched seven more seasons in the minor leagues retiring from pitching in 1957. He earned the nickname "Chick" when a doctor had to remove a chicken bone from his throat. During the off season he worked in a San Francisco slaughter house killing steers. He also played the accordion in an Italian wedding band in the sixties & seventies, as well as running youth baseball programs in the Bay Area. Legacy: In 1977 when Pieretti was diagnosed with cancer, since his old baseball days he had become despondant & isolated himself at home. Some of his old baseball pals from the San Francisco area took him out to a lunch in his honor & the Friends of Marino Pieretti Club was formed. Even though the doctors had told him not to drink he ordered a Pink Squirrel saying " if you're gonna die, you might as well die happy". There were many lnches in his honor until he passed away in 1981 at age 60. Since then the old San Francisco area ball players still gather for a luncheon once a year & raise a glass in his honor.